Images not to be used by the tobacco industry. 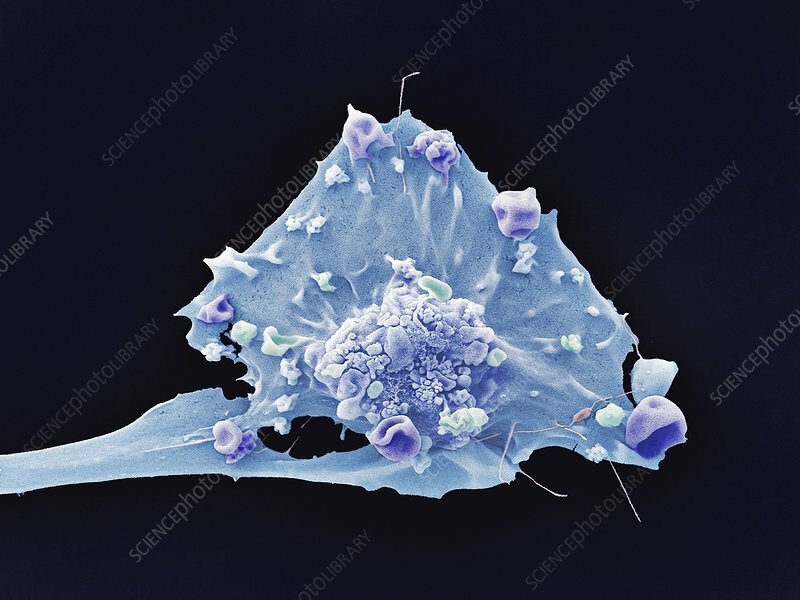 Breast cancer cell, coloured scanning electron micrograph (SEM). Breast cancer forms when abnormal cells divide rapidly in an uncontrolled and chaotic manner and clump together to form tumours. Breast cancer is the most common form of cancer in women, with 1 in 8 women in the UK developing breast cancer during their lifetime. The cell in this image has long extending filopodia-like structures. Filopodia contain actin filaments and can have roles in numerous cellular processes including cell migration, acting as a sensory guide towards a chemoattractant (a chemical agent that induces a cell to migrate towards it). Magnification: x3000 when printed at 10 cm wide.